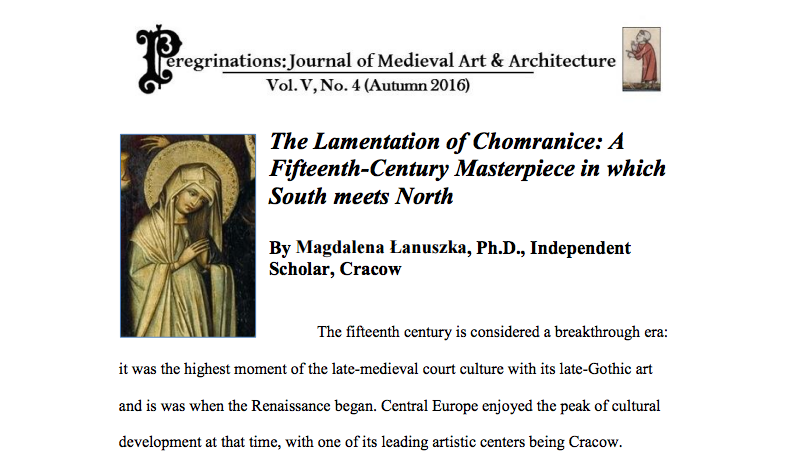 I am very happy to inform that my article on the fifteenth century panel painting called “Lamentation of Chomranice” has just been published. It is a rather unique gothic masterpiece – so unique that I had troubles publishing the article about it in the British periodicals, due to problems with finding the reviewers for such an odd subject (!). But, as it turned out, it was not such a problem in the US: here it is, published in the Peregrinations: Journal of Medieval Art and Architecture, after receiving two peer reviews. I have initially researched the Netherlandish influences in the Lamentation of Chomranice; the Italian influences, also present in this painting, seem on the other hand to lead to Siena (where I believe the painter spent some time in the first quarter of the 15th century, most likely in the circle of Taddeo di Bartolo). Further research led me to the conclusion that the Lamentation of Chomranice should be dated to the second half of the 1430s. I have also proposed a hypothesis (for further discussion) that this panel may have been related to the Corpus Christi chapel in the Franciscan church in Cracow (consecrated 1436).